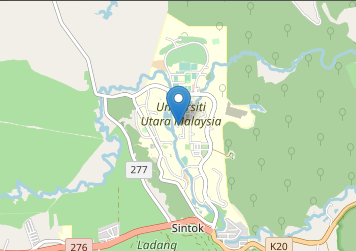 The material made available through Universiti Utara Malaysia (UUM) website is for information purposes only and cannot be used and/or relied upon for any other purpose. UUM makes no representations or warranties of any kind, either express or implied, as to the completeness, accuracy, reliability, suitability or availability of this website or the information, products or services contained in these pages or their fitness for any purpose whatsoever. Any reliance you place on such information is therefore entirely at your own risk. Whilst every effort has been taken to ensure the accuracy of the information in these pages, their content is naturally subject to change. It is the responsibility of the user/reader to check the accuracy of relevant facts before entering into any financial or other commitment based upon them. In no event will UUM be held liable in contract, tort (including without limitation negligence) and/or breach of statutory duty for any direct, indirect, special, incidental or consequential loss or damage (including but not limited to any loss of data and/or economic loss and/or loss of profits) arising out of or in connection with the use of this website or the information contained therein. Within this website you are able to access and link to independent third party sites which may feature information which is of interest to you. UUM has no control over the subject matter, content and/or availability or otherwise of such sites and as such, assumes no responsibility whatsoever in respect of such site(s). The inclusion of any links does not necessarily imply a recommendation or endorsement of the views expressed within in them, by UUM. Please advise us if you consider any third party links to be inappropriate, illegal or offensive. UUM reserve the right to remove such links if in its sole opinion UUM believes it to be inappropriate, illegal or offensive. Every effort will be made to ensure that this website runs without any problems or interruptions, however UUM will not be liable for and takes no responsibility for this website being temporarily unavailable due to technical or other reasons. UUM will, upon notification, consider removing any material open to legal objection pending investigation.